This week I am going to highlight the Great Dane. They are Avery's favorite dog and I have to say, I love them too! They are also know as the woulds biggest lap dog! They love to love! Great Danes are people dogs. They don't do well if left outside or if they aren't an integral part of their human's lives. They are among the most loyal of dog breeds and absolutely adore their humans. And all they want -need- in return, is to be loved back. 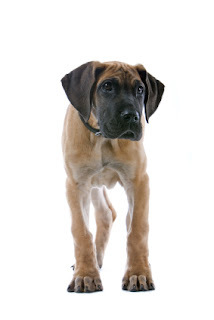 The Great Dane is not the heaviest of dogs -mastiffs are generally heavier. Gibson, a Harlequin Great Dane, is certified by Guinness World Records as the tallest living dog at 42.2 inches. Standing on his hind legs, the 170-pound dog is over 7 feet tall. But Danes have a very distinctive anatomy and it is a wonderful blend of size, muscle and bearing that make the Great Dane the "dog of dogs". The smooth short-haired coat is easy to groom. Comb and brush with a firm bristle brush and dry shampoo when necessary. Bathing this giant is a major chore, so it pays to avoid the need by daily grooming. The nails must be kept trimmed. This breed is an average shedder. 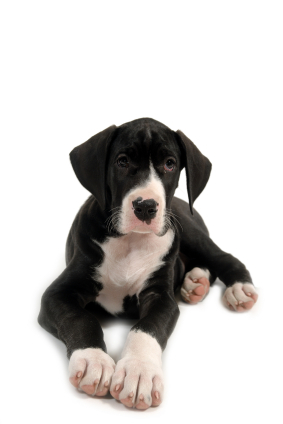 Known as the "gentle giant" and the "king of dogs," the Great Dane was originally bred as a hunting dog but is now bred as an exceptionally large companion dog. And he makes a good one. He is a gentle, friendly, docile, peaceful, and a really, really big dog. He is exceptionally devoted to his owners, especially children. 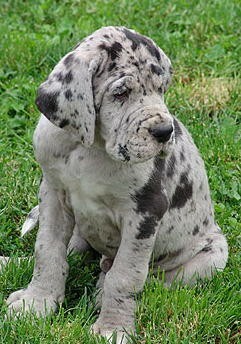 However, a six-month-old Great Dane puppy will outweigh a six-year-old child, so parents must be cautious that no one gets accidentally squashed. But the Great Dane is people-oriented and committed to pleasing them. They are playful, and will need to be walked daily, but their exercise needs are only moderate. They also love to nap with you, and will take over your couch. They might also go steal some food off the countertop before you wake up. They make good watchdogs, and are often reserved towards strangers, but in general, they don't bark much. They get along well with other animals. They are trainable and do well in the competition ring. They are also quick to housetrain. So, if you are looking for a dog that honestly believes he is a part of the family ... if you are looking for a gentle giant to have in your home ... who will be able to sit and look you in the eye at the dinner table ... if you are looking for a peaceful, devoted companion who loves his family and home, then the Great Dane might be for you. Captain Kirk had a Great Dane ? I did not know that.Did you? I had no idea that Captain Kirk had a Great Dane. I thought that that was a very interesting fact. I loved learning about the Great Dane and I'm glad you learned a little something too! I had no idea that Captain Kirk had a Great Dane. I thought that that was very very fun and interesting fact! I had a lot of fun learning about the Great Dane and I'm glad you learned a little something too! I am the world's biggest dog lover! Big and small, I love them all! I am a dog trainer, walker and activist. I write a weekly newspaper column called Beach Pups and contribute to ecology.com.